This stunning period property underwent substantial renovations over a number of years by its current owners and we were very fortunate to have been commissioned to carry out an extensive programme of works. The grand entrance hall was panelled with high dado oak panelling, this continued up the opulent staircase. Open cut strings were used on the main staircase which incorporated cast iron spindles and a stunning monkey tail handrail. The bespoke door surrounds, with heavily hand carved mouldings were incorporated in this lavish hallway, with a number of period panelled doors, all of which were manufactured and aged and polished to the clients’ individual requirements. A large bespoke oak glass display cabinet was made to complete this exceptional and elegant entrance hall. 'Having used DCF as part of the team responsible for a multi-million pound refurbishment of our main residence I have no hesitation in highly recommending them to any potential client. To the first floor landing, the cast iron balustrade and sweeping hand carved handrail continued, with high dado oak panelling to the pillars, creating a sumptuous and lavish overall effect. A second staircase was made and installed from the landing to the top floor, complete with under stair cupboard, open cut strings, hand turned balustrade and a sweeping handrail, again in oak, aged and polished. The back staircase, again in solid oak with under stair cupboard, was made and installed to complete the continuity of design and desired effect. Alterations to a few other pieces of furniture were also carried out, one of which was to adapt a large oval dining room table into a circular table. This involved adjusting and adapting the position of the heavily carved bulbous legs , additional lengths of hand carved apron were made for the underside of the table to match the existing. Two carver chairs were altered to side chairs, two new chairs made to match and all the chairs , ten in total, were reupholstered in fabric which was supplied by our client. All in all, a stunning transformation. 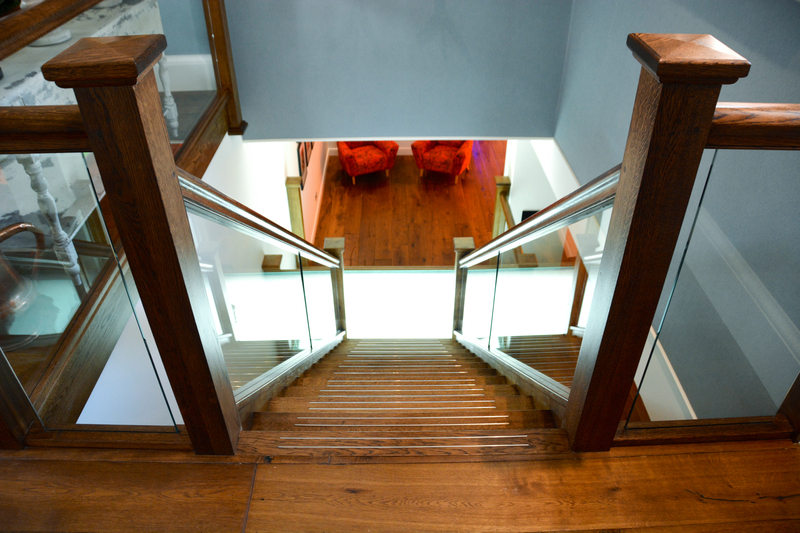 A fourth staircase, with a very modern twist, was manufactured and installed in another part of the house and, with glass panel balustrade and dramatic lighting, gives it an altogether different, but very pleasing, guise.